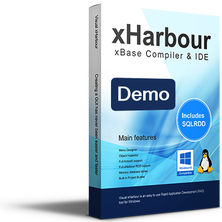 See how fast and easy it is to build professional build applications with xHarbour Builder! This free demo is fully functional and is only restriction by a "Demo" message that appears when the build application is run. Click on "Register & download" to start downloading the free demo edition right away!